Designing and building an elegant landscape outside your home or business is not always all about the plants. 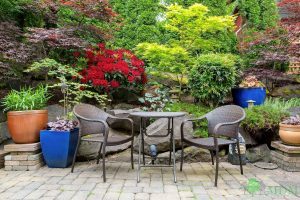 While the greenery is a big part of landscaping, there is a second part that ties everything together to create a functional space in your landscaping. This second element is call hardscaping. Hardscaping is the heavier elements in the landscaping. It can include driveways, stone pathways, stone walls or other solid elements. If you’re interested in learning about the types and styles of hardscape materials, MDM Landscapes offers services to install and replace hardscaping. Hardscape Materials Make Great Patios and Outdoor Living Spaces. Hardscaping is important to the design of any outdoor space. First, it creates an extra living space. Often times hardscape materials take on the form of a patio, which creates a place for people to gather and enjoy the natural beauty of the plants and other elements of the landscape. Second, it breaks up the landscaping. Without some hardscape elements, such as walls and pathways, a well designed garden will look like nothing more than a field or forest. Hardscaping creates breaks and helps you understand the function of the space. Finally, the heavier materials provide landscaping design options for areas of high drought and heat. Green plants need a lot of water. Hardscape materials don’t require water, but it can still create a unique appearance in your outdoor living spaces. If you’re interested in learning about the benefits and uses of hardscapes, contact the office of MDM Landscapes at 817-396-0125. We are here to help you design the perfect landscaping for your home or business. Posted in Uncategorized on November 28, 2017 at 5:36 pm by MDM Landscapes.